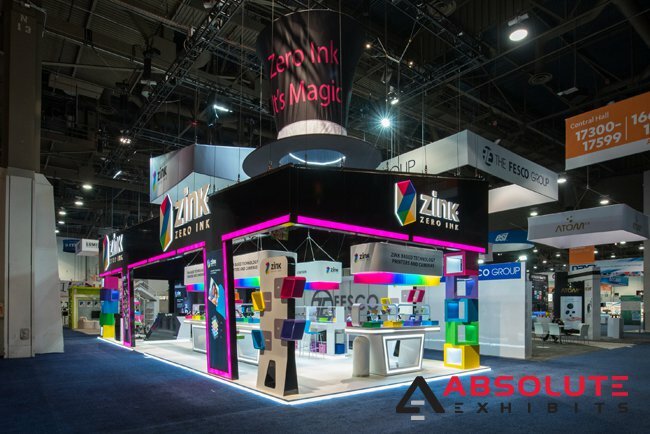 Client Spotlight: Zink at CES 2018 | Absolute Exhibits, Inc. The Consumer Electronics Show (CES) has evolved over the last 50 years to become the world’s largest gathering of consumer technologies. Every January, attendance grows larger and is at nearly 200,000 attendees. This has become the perfect place to unveil new products and display cutting edge technologies to the delight of consumers. With multiple halls, CES features over 3,900 exhibitors in product categories such as the virtual reality (VR), Internet of things (IOT), wearable technology, automotive, health, artificial intelligence (AI), and more. The technologies featured seem nearly endless. 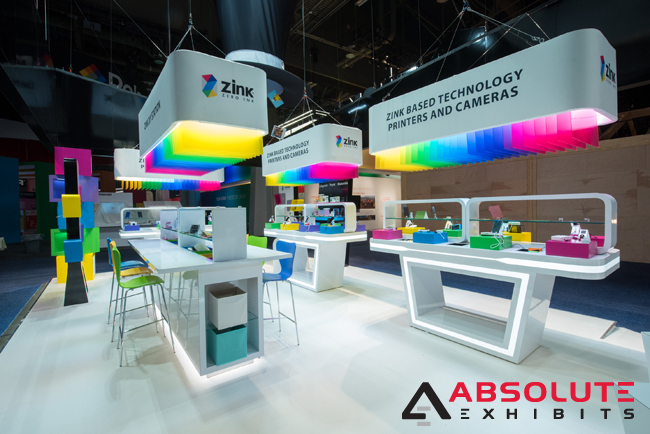 At CES this year, Zink partnered with Absolute Exhibits to produce an 1100 sq. foot trade show booth that highlighted their bold zero ink printing capabilities in bold bright colors. 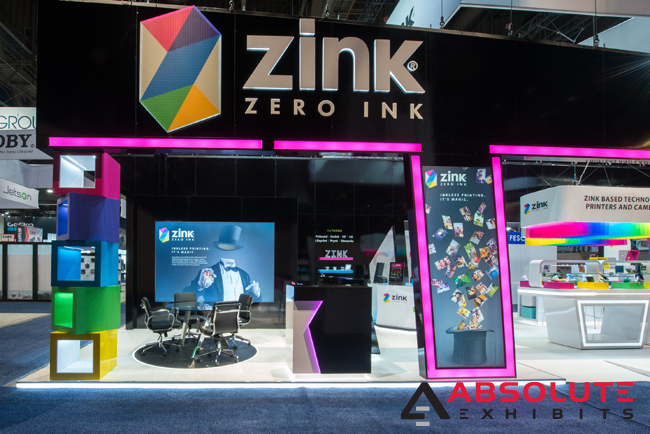 Zink offers a zero-ink solution that fuels instant print cameras and mobile printing solutions. Modern, environmentally friendly and bold, they wanted to showcase these qualities in their trade show booth at CES. Absolute Exhibits was challenged to produce a bright and modern trade show booth that showcased the brand in a fun and enticing way, playing on the tagline that “It’s Magic”. Absolute Exhibits built a fully customized trade show booth around the magician concept. Above the structure was an oversized hanging fabric sign in the shape of a magician’s hat, featuring the brand name and the tagline. The hanging sign drew consumer’s eyes to the backlit and front lit channel lettering at the top of the booth. Inside the structure, the magician’s theme was repeated with graphic images and hanging picture collages to convey the magic and wonder associated with their brand. The trade show booth was constructed of a custom CAM wood gloss paneled structure with light spectrum columns and diagonal light box supports with LED accent lighting. Below the structure was a raised flooring connecting the product demonstration area to the inside kiosks and meeting area. The highlight of the glossy structure featured 3 product displays with LED accent lighting and glass insert shelves and a crafting table with glass inserts. Hanging above these were 4 hanging signs with plex color spectrum. The open floorplan of the trade show booth encouraged consumers to interact with products and discover the magic of the brand. 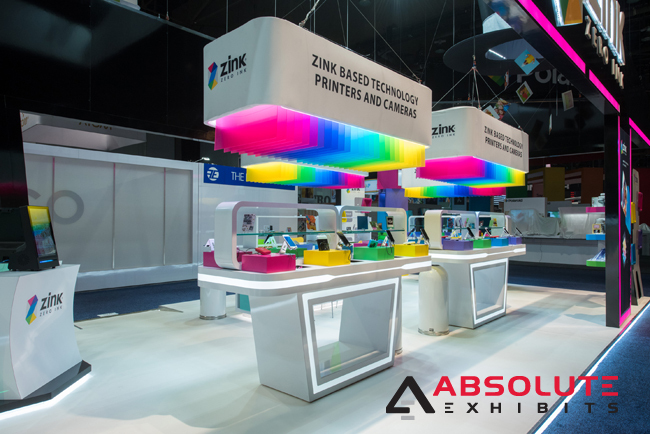 “Our team was very proud to bring Zink’s vision to life on the trade show floor. Working collaboratively, we produced a trade show booth that earned praise across the show for its creative use of color and modern high-tech feel,” said Account Executive Kyle Moeller. 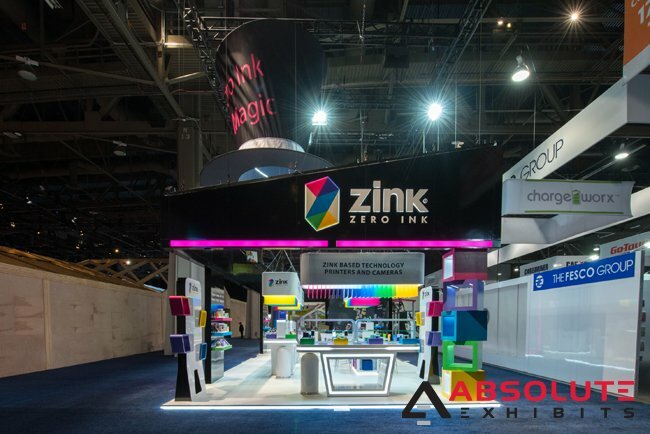 The Zink trade show booth was highly successful as attendees wandered around the open floor plan to test products and learn more about the technology powering the printing of the future.